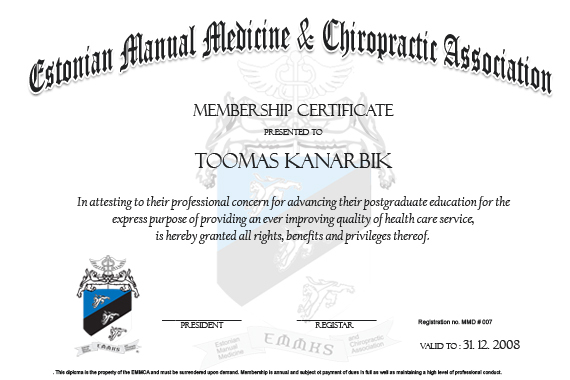 Have completed either an accredited doctoral program in medicine, osteopathy, dentistry, chiropractic, traditional chinese medicine, acupuncture or naturopathy, or have completed an accredited degree or diploma program in physiotherapy, kinesiology, athletic therapy or massage therapy. Have achieved a minimum level of 500 hours in the natural or manual medicine fields. 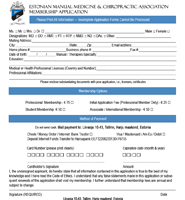 Student membership and “Grandfather clause”: Because Estonia is still coming of age with respect to manual medicine regulations and education, students attending schools to become certified in one form of manual medicine or applicants having already practiced in their field may recieve immediate conditional membership in Estonia if they are actively enrolled in courses or programs leading to completion of membership prerequisites. A time limit of 3 years will be given for completion of pre-requisits. Provide proof of applicable licensure or accredited schooling. Provide copies of certified educational transcripts. Review and Sign Member Agreement and include it with your application. You must complete twelve hours of continuing education units annually in order to renew your membership. CEU’s must be approved by the EMMCA. For an updated list of approved courses please visit our continuing education site. If you want to attend a seminar that is not listed, you can fax the seminar information to EMMCA for the Board of Directors approval. If the seminar meets the requirements, EMMCA will list the seminar on the website. You will be contacted if the seminar was not approved.